Problems? What problems? Just keep that fire blazing and no one gets the pit bull treatment. I considered calling this post "Selvedges -- the Good, the Bad, and the Ugly" -- I've known them all. For me, selvedges thrive on inattention; the more I fuss the worse they get. 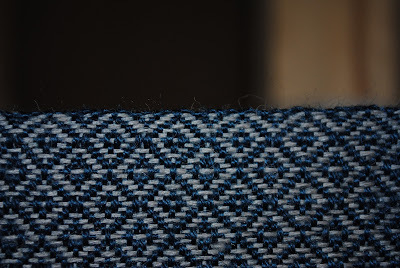 It's best if I just have a glass of wine and weave on . . . .
For anyone struggling with selvedges, fear not, there's plenty of wisdom out there for you. Today we focus on the common problems of bad selvedges and broken threads. I had an entire weekend at home this week, and other than taking a long run, knitting with a friend, and watching the Patriots spank the Bears in blizzard (the way football ought to be), I worked in my studio. 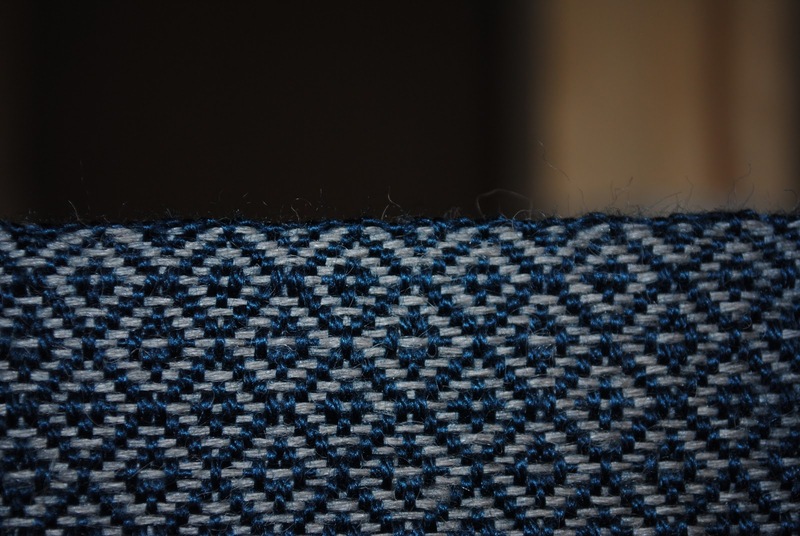 I'm weaving up my Alpaca-Silk warp with weft of deep blue Colerain Lace (merino-silk, both from WEBS). It's a lovely combination that reminds me of bluewater sailing in Florida. I have enough warp on for 2 scarves, and I'm thinking about a trip to Halcyon to find the second weft . . . .
Alpaca Silk in the raddle -- 22 epi. I too have seen all selvages in all their variations and like you, I find the more I mess with them, the worse off I am. Your selvages look fantastic! The merino/silk looks beautiful. I've often wondered how that weaves up and now I know. Hmmmm, looks like an internet shopping moment coming on. And what a handsome dog keeping the hearth safe. Oh don't I know that look about Kong toys too.....pass some pets along please and those Kong toys, don't forget the treats inside. I love Webs Colrain Lace. I added the same blue to my collection when it was on sale a couple of weeks ago. And they have some new colors now that I'd like to get.